We left the Novar Arms hotel after another fantastic Scottish breakfast. 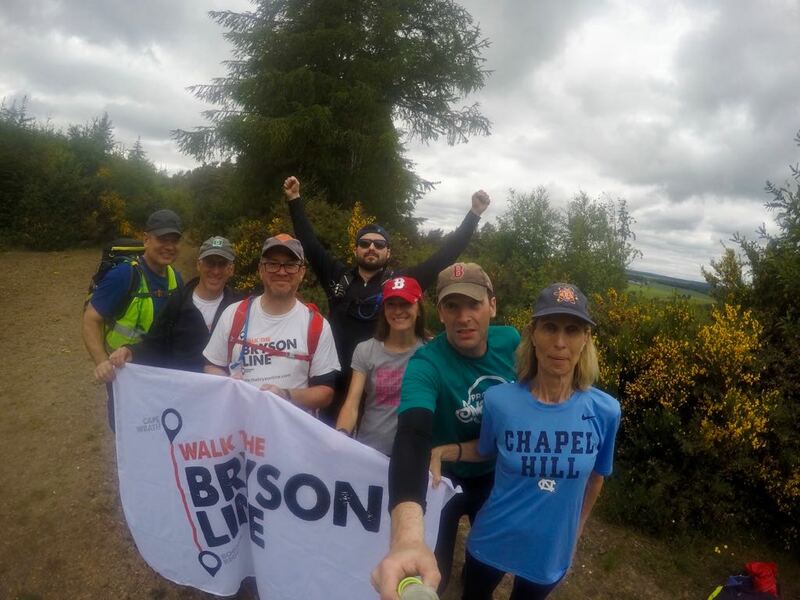 The team was looking forward to a change from the previous two day’s, walking on roads and set off in good spirits having said goodbye to two walkers (Eric and Patrick) and welcomed a new one (Angela)*. 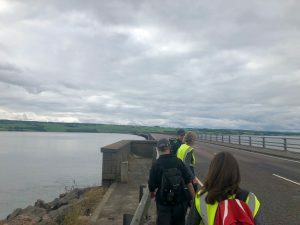 We were walking from just north of the Black Isle across the Cromarty Firth on Cromarty Bridge, over the Black Isle and then across the Moray Firth on Kessock bridge and into Inverness. The Black Isle derived its name from the fact that for extraordinary reasons, snow does not stick in winter. The walk up from Cromarty Bridge into the lush early summer countryside was thankfully not too steep and the weather was kind, not too hot, cloud and not much chance of rain. It was a real pleasure getting off the road! We had an eventful walk over the Black Isle. Climbing up to the centre our path took us through a farm with a field of what, at first glance, looked like cows and their calves. As we got closer we spotted a very large bovine lying down. Let’s call him Captain Beefheart. It soon became apparent that the cows and calves were all mixed breeds and that there was every chance that Captain Beefheart was king of this harem. When the old Captain stood up, we understood that this was probably very likely. 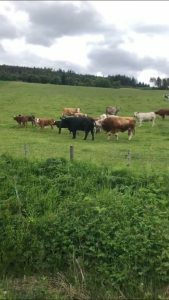 Zoom in on the picture…..
We had a good chuckle at his “tackle” but got our comeuppance minutes later as we walked through the farm stopping to talk to, we assume, the farmer’s wife. Explaining we were walking to Bognor Regis, we were met with a smirk and a knowing nod. We continued on our path to find ourselves suddenly on a path that had become very overgrown with gorse bushes. 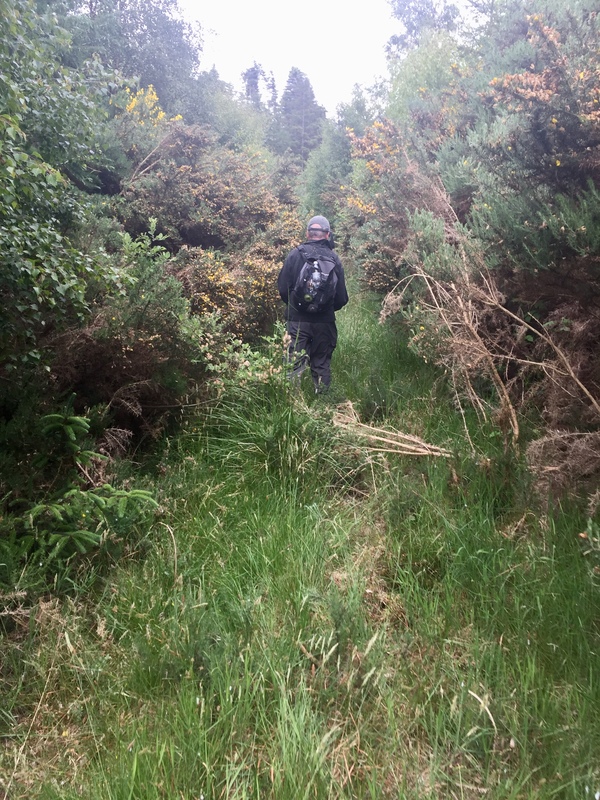 We then spent the next hour navigating our way through thorns (briars) and a bog on a path that clearly was not in regular use. This heralded the start of our lost hours as we discovered that walking a route plotted online can sometimes lead to wrong turns. After nearly 9 hours we finally broke through undergrowth to see Inverness. Our second, and final, bridge was the Kessock bridge, built in 1982 and now a busy four lane highway. Thankfully the wind was blowing in the right direction to ensure we were not choked by exhaust fumes. We arrived at our hotel, the salubrious Wetherspoon’s Kings Highway a little after 6:30 pm, tired and a little sore, but happy to arrive safe and sound. See you down the line. *Note: Kate, Alex and Roger are attempting to walk all 30 days of the Bryson Line.